Home / STORE / Nisse / Newborn Nisse. These darling little Nisse have only just been born. They are ever so tiny but full of cuteness! Such a special and unique gift for a newborn and their parents. They wear either a Pink or Blue babygrow with tiny dots as decoration. A white wooly hat will keep the warmth in, especially in the forest. 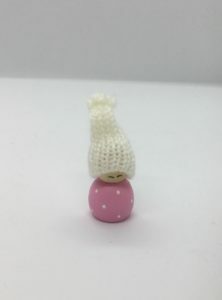 A wonderful way to gift wrap your newwborn Nisse is to buy a Newborn Cone. 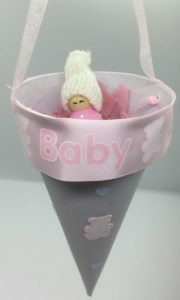 The little Newborn Nisse will be all cosy and warm wrapped up in there if you place some tissue in the cone.